One of the most underrated times of the sports year- the MLB offseason. All of the blockbuster trades and huge names signing with new teams as free agents, wow. It’s also fun to discuss and debate different awards that players won or should have won. I don’t think we’ll see as many angry discrepancies this year as we did last year with the AL MVP race, but it’s still been a fun ride. Today, I will be reminding you who won each of the major awards in the National League. For each of the awards (with the exception of the first 2, because there are just too many winners for me to defend or fight each one), I will explain who I believe should have won and why. I only disagree with one, but I will still explain the reasoning behind each. Hard to have a better individual story than Liriano. Coming up with the Twins as a co-ace with Johan Santana, Liriano showed great poise. Throughout his Minnesota tenure, he was seen as one of the top pitchers in the AL, including a 2011 no-hitter against the White Sox. Then came 2012, and Liriano just looked lost. He got demoted to the bullpen and eventually was traded to those same White Sox. His ERA for the year sat above 5, and when the Pirates signed him as a free agent, everyone questioned what they were thinking. What they were thinking was that he could return to his early Twins form, and he did just that. You’d be hard-pressed to argue against Liriano for this award. I get it; Yasiel Puig was a national sensation since his call-up in early June. His numbers suggested he could’ve been an All-Star, despite only having one month of big league experience (I completely disagree with this belief, but that argument is for a different time). Pretty much any other year and Puig would be the hands-down ROY. But not this year. Shelby Miller was also an excellent story, winning the 5th spot in the rotation on the last day of Spring Training over best friend Joe Kelly. What people will always remember about his season was his game against the Rockies, when, after giving off a single to lead off the game, he retired the next 27 consecutive batters. He may also be remembered for only pitching one inning in the entire postseason as a way to make it seem like he wasn’t actually shut down when he really was. If he was in the American League, he’d definitely win this award. But neither of these two finalists stood a chance against Jose Fernandez. Had it not been for a guy named Kershaw, he’d probably win the Cy Young award too. Like Miller, he won the last spot in the rotation at the end of spring training, and only because of injuries in the rotation to Henderson Alvarez and Nate Eovaldi. He only pitched above A-ball in 2012, but you couldn’t tell by watching him this season. With a 5.79 H/9 ratio to lead the MLB, an elite 9.7 K/9, and the second lowest ERA in the majors at 2.19, it can clearly be seen that, this wasn’t just one of the best rookie seasons of all-time, this was one of the best pitched season in many years (well, of course, besides Kershaw’s year this year). If anybody saw him at the All-Star game this year, there wasn’t a pitcher that made you say “wow” like the way everyone did for Fernandez. His stuff was absolutely electric, like it was all year. And, oh by the way, his 1.19 home EAR ain’t too shabby either. And keep this in perspective: the only 2 players younger than Fernandez to make their MLB debut with the Marlins – Miguel Cabrera and Mike (at the time) Stanton. Either of those guys sound familiar? The Pirates were the most fun team to follow this year. After 21 consecutive losing seasons, a North American professional sports record, and after not making any huge offseason moves (with the exception of acquiring Mark Melancon from Boston in the Joel Hanrahan trade), the Pirates were again expected to settle towards the bottom of the NL Central. 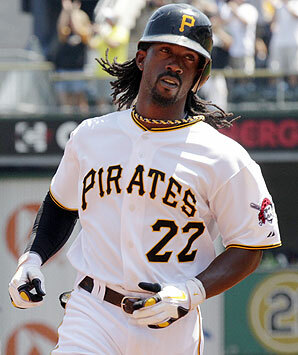 A team that starts and ends with Andrew McCutchen, the Pirates were seen as a one-man team to begin the season. Clint Hurdle turned this team’s attitude around. He made each of the other 24 guys on that team feel as important as the runner-runner-up for the NL MVP in 2013. They all stepped up, and the Pirates were a huge success. They finished in 2nd place in the division, earning the first Wild Card spot. They beat the Reds in the Wild Card game and took the eventual NL Champion Cardinals to the maximum 5 games of the NLDS. This team had all of the fight in the world, and Clint Hurdle deserves much of that credit. Fredi Gonzalez and Don Mattingly were worthy finalists for the award, but neither could possibly be seen as a more deserving winner for this award than the Pirates’ skipper. Just to start off: the one argument I don’t want to hear about who is a more deserving MVP is whoever has the highest WAR. If the player with the highest WAR in the league is the MVP, then Ben Zobrist would be a two-time AL MVP. Yes, Ben Zobrist. And Carlos Gomez would be the NL MVP this year. I don’t think anyone would agree with either of those statements (sorry, Rays and Brewers fans). This is a nice debate. This wasn’t a runaway contest by any stretch of the imagination – or at least it shouldn’t have been. It’s not outrageous that Goldschmidt didn’t win it, but I think he was easily the most deserving candidate. What was outrageous, however, was that he didn’t even receive a single first-place vote! He led the NL in HRs, RBIs, slugging percentage, extra-base hits, total bases, OPS, OPS+, and intentional walks. He was also 4th in the NL in hits, on-base percentage and plate appearances, 3rd in walks, tied for 3rd in runs scored, and 2nd in runs created and AB/HR. He was also one of only 4 players in the MLB to earn both a Gold Glove and Silver Slugger (Adam Jones, J.J. Hardy, and Yadier Molina). And let’s put the argument that only playoff-bound players are eligible for this award. He cannot affect what his team could do. (By the way, if you want to make the argument that he can affect his offense, the Diamondbacks actually scored 51 more runs than the Pirates. The Pirates’ pitching is the only reason they made it to the playoffs.) Paul Goldschmidt is at the top or very close to it in so many offensive categories that it is nearly impossible to say that he wasn’t a better offensive player that McCutchen. He also won a Gold Glove, unlike McCutchen, so his defense was actually better, too. Yadier Molina also had a phenomenal season, but he didn’t play enough games to get much of my consideration. When you put it all together, it should be clear that Goldschmidt should’ve won the award, and maybe even ran away with it.